General Motors and the Chrysler Group have continued to improve their rating in this year's survey of suppliers in the12th annual study of OEM working relations. Last year, Torque News reported an academic study highlighting the importance of good working relations between automotive manufacturers and parts suppliers as intrinsic to further success. This news reflects the post-bailout turnaround of the American manufacturing concerns. When an automaker has a hot product, they need more parts faster. When a part is updated or redesigned they need the flexibility from their suppliers to incorporate the changes quickly and produce the high quality parts needed. In order to accomplish such up, down and sideways course alterations, automakers need a close working relationship with their suppliers, with no room for distrust. Toyota and Honda are still in first and second place in the suppliers estimation, but the news is their numbers are slowly decreasing while the U.S. Big Three have been improving since 2005, although Ford’s ranking this year decreased slightly. The Asian automakers have fallen to their worst scores in 11 years while Chrysler, GM and Ford have improved dramatically and as a group, have achieved their highest scores ever. Nissan's rankings also fell during this period but showed a meager improvement this year. Nevertheless, Nissan could easily lose fourth place to GM or Chrysler next year, provided they continue their current trends. A mere eight points separate the three. For 2012, Toyota and Honda are first and second, while Ford fell a bit but continues to lead the US automakers in third place overall, despite stalled improvement over the last three years. Nissan remains in fourth place, while GM and Chrysler continue in fifth and sixth place respectively. The data all comes from the 12th Annual North American Automotive OEM-Tier 1 Supplier Working Relations Index Study conducted annually by Planning Perspectives, Birmingham, MI. The study is concerned with supplier perceptions of working relations with client automakers, ranking the OEMs across the six major purchasing areas subdivided into 14 commodity areas. The results are used to correlate the Working Relations Index (WRI) based on 17 variables. This year, 564 workers from 439 suppliers participated, representing a full 62 percent of the six automakers' annual parts purchases. However, nobody's promising a rose garden. "It's a concern that all of the automakers are 'converging toward mediocrity' in the overall low Adequate range in the Working Relations Index which is equivalent of a grade C in academia," said John Henke, president of Planning Perspectives and a Professor at Oakland University. In fact, 40 percent of suppliers still delegate the Big Three and Nissan to the "Poor – Very Poor" range. According to Henke, there are several reasons for this. US automakers have made improvements only by fixing a few fundamental relations problems – the low hanging fruit, if you will. These are easily identified problems like Chrysler improving the process to quickly rectifying late payment issues. Considerable performance variation marks all OEM purchasing areas except GM's. For example, Honda's Electrical & Electronics group scored 328, while its Body-in-White group only scored 231. Implementation of Working Relation improvements is sporadic at best, and thus inconsistent within each OEM. 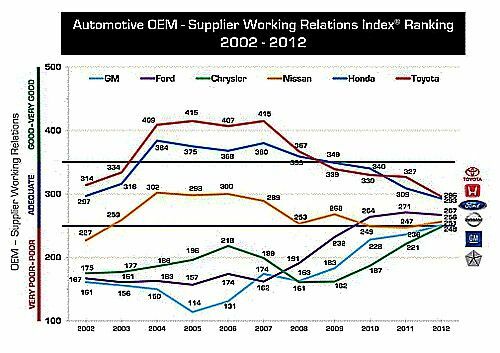 For example, if GM had maintained its ranking in the Help category, it could have surpassed Nissan and Ford in its overall WRI ranking. While the automakers' top purchasing execs understand and support positive relations, a number of individual buyers working for them apparently do not. Poor working relations result in added costs to automakers making the importance of good relations paramount. This can only increase as more automakers are manufacturing more vehicles here and competing for the same suppliers. Automakers with Good or Very Good rankings benefit with suppliers more willing to invest in new technology and share new technology with the brand. Suppliers are likely to perform beyond contractual terms and deliver their best personnel to work with the brand. Open and honest communication frequently results in price concessions to the manufacturer. "However, in spite of their willingness to give greater price concessions, OEMs have to give up the idea they can expect a 5 percent reduction annually," stated Henke. "That's a race to the bottom and it will eventually destroy suppliers. The price of vehicles does not decrease five percent a year; if it did, automakers would go out of business. So why should the price of parts?" Poor relations with suppliers tend to be followed by smaller price concessions more being more difficult to bring to the table, working with less experienced personnel and not being first in line for the supplier’s ideas and innovations. To improve supplier relations the key factor is consistency in managing the purchasing-engineering-quality connections. "The automakers must understand that maintaining supplier working relations is a never ending process; it's dynamic, not static, and requires continuous attention," Henke added. "Decades ago, US automakers thought they were building the best vehicles possible – until the Japanese came here and suddenly everything changed. Automakers now expect 100 percent quality and are building the best vehicles they ever have. "It is going to take that kind of focus and discipline to consistently achieve high levels of supplier relations – and the payoff will be just as valuable. Look at Chrysler's performance during the Stallkamp days and where Toyota was only five years ago in the WRI ranking. It can be done – and Dan Knott did a remarkable job getting Chrysler turned around. However, the challenge for Chrysler, GM and Ford will be to continually improve how they are working with their suppliers in the coming years and not stall, or worse – fall back to their adversarial practices – something that suppliers are telling us more frequently is already happening." There are main two things automakers can do to address this problem, according to Henke. They should focus their resources to train personnel for improved quality of working relations with quantifiable metrics – the same way product and manufacturing quality were improved. Lastly they need to make their buyers understand poor supplier relations cost the automaker money and will not be tolerated. "Adversarial practices" like paying back pennies on the dollar during bankruptcy? Both GM and Chrysler screwed over a lot of their supply chain during their gov-funded reorganizations.